Football Rules slot machine from Playtech is a 5-reel mobile video slot that has 25 paylines and a maximum jackpot of a massive 10,000x per line bet. This football-themed game has one bonus round, which is a free spins bonus round that rewards players of between 10 and 20 free spins and there is a mulitplier giving up to 10x, thus really helping to crank up the big wins. Check out full details below in the Football Rules slot review. Another entry in the already packed canon of soccer-based slots, the Football Rules slot is a five-reel, 25-adjustable payline title from Playtech slots that attempts to capture that World Cup winning feeling. With a range of unique symbols including numbered shirts, goalkeepers and stadia, the slot does a fairly decent job of conveying the big match atmosphere to players but suffers from the fact that graphics-wise it’s pretty ugly. Indeed, if the Football Rules slot machine were a referee, it would be Pierluigi Collina. If they are able to look past the game’s disappointing visuals, mobile casino players will at least discover a title that can be enjoyed on a wide range of devices for as little as £0.25 per spin with all paylines activated. Not only that, but for an additional £1.00 they’ll have access to the Dollar Ball progressive jackpot fund and there’s also a handy free spins feature that can be used to boost their base game winnings. For those not already familiar with the Dollar Ball progressive jackpot system, this is an optional mini-game that players can opt into for an additional charge before each spin. Should they do so, they’ll have to pick five numbers from the 49 available, with a lottery-style draw then taking place. Matching all five picks will result in them winning the jackpot, with smaller prizes also being issued. 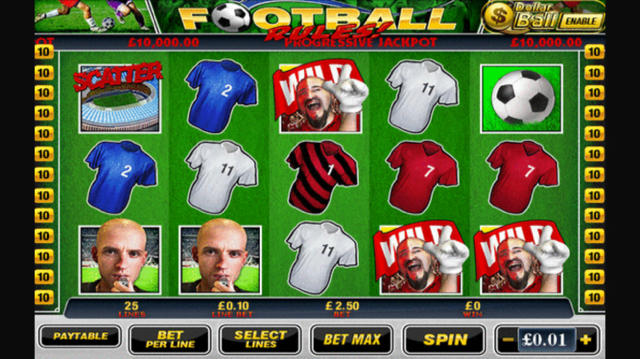 The free spins feature, meanwhile, is an in-reel bonus that is activated whenever the Bobby Moore/World Cup icon appears on reels one and five simultaneously. When this happens, players will first have to pick a football to uncover their number of free spins and then choose which section of the goal to hit a penalty at, with this in turn unveiling a prize multiplier worth between 2 and 10x. In an ideal world a maximum number of 20 bonus spins can be achieved with the top-level multiplier in effect – and naturally this can create some pretty sizeable bonus wins. An additional five free spins can also be secured in the Football Rules slot for landing two subsequent bonus symbols, further prolonging the feature. Although a decent game in its own right, the Football Rules slot is one of the more simple soccer-themed slots from Playtech and doesn’t boast the graphics or sound to see it safely out of the group stages. Like the Football Rules slot review? Check out these as well…..